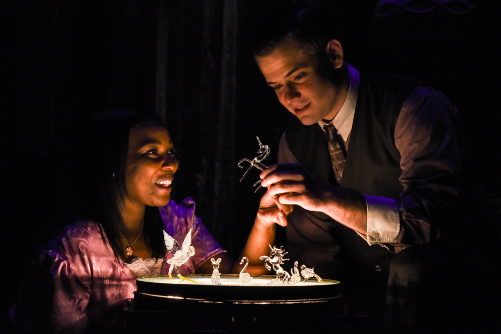 Olivia Washington and Doug Harris in The Glass Menagerie. Photo by Russ Rowland. BOTTOM LINE: Revisit or discover this masterwork courtesy of the new Masterworks Theater Company. It can be seen as either an incredible breath of fresh air or unforgivably passe in this town to produce the classics. In a world of new work, world premieres, and the latest, greatest, immersive/devised/trend-setting/downtown work we are greeted by the Masterworks Theater Company’s earnest attempt to produce only the plays that must be seen by students in their most formative years. Additionally (as we were informed by the company’s executive director during a curtain speech), the plays will reflect the face of a changing America. Indeed, this production features a majority of actors of color. I confess, The Glass Menagerie is on my top-three-greats list. And I would suspect this is the kind of thing Masterworks will come up against in in its search for the ultimate drama textbook canon. And it’s a ballsy move to open with a show just remounted last year to great acclaim by John Tiffany with Zachary Quinto and Cherry Jones just blocks away from the minuscule 47th Street Theater. A quiet, fragile, and beautiful play, The Glass Menagerie is retold by Tom (played with command by Richard Prioleau) -- an embodiment of Mr. Williams himself -- as he wrestles with his decision to leave his mother Amanda (an endearingly irritating Saundra Santiago) and sister Laura (Olivia Washington) to travel the world. The motivations could not be more obvious as this “selfish dreamer” takes frequent late night drunk trips to the the movies and perhaps less truthful magic shows. At home, Amanda contends with her opposing home-body daughter Laura who would rather play with the victrola and her glass animal figurine set than attend business college as her mother has already paid for. Additionally, Laura is “crippled” with a limp (and in this production with a rather unnecessary and incessant twitching) which causes a massive “inferiority complex” that has prevented her from venturing onto the dating scene. Amanda naturally takes it upon herself to find a Gentleman Caller for her, Jim O’Connor (Doug Harris). In one of the theater’s all-time greatest scenes, Laura and Jim meet, fall in love, and form a relationship as tender and brittle as glass. I’m afraid this production falls into some of Williams' traps by largely playing the melancholic, emotional mood of the play rather than the action at hand. Not aided by a rather filmic and melodramatic sound design (by Brett Macias) and an underutilized, fabric-strewn set sans fire escape (by Campbell Baird), we’re offered an unrelatable Menagerie without the necessary heart. The exception here is Doug Harris’ exhilarating Jim O’Connor who provides an endearing if troubling light to this production. We hope, like Amanda, for him to be the departure from this melancholy. I wish Masterworks much success on their flagship endeavor. Their fare is largely and oddly missing from our theater community. I look forward to their future endeavors (up next is A Midsummer Night’s Dream). What might frighten any other new company is no concern for Masterworks.